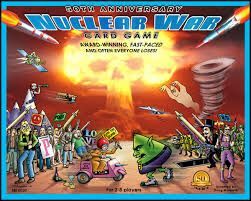 NUCLEAR WAR CARD GAME: A comical cataclysmic card game for 2-8 players of all ages. A humorous confrontation between touchy world powers as each player attempts to sway his opponents' populations with diplomacy, propaganda, and finally nuclear weaponry. Little old ladies defect in electric cars and the dread SUPERGERM spreads devastation! Takes about 10 minutes to learn and about 30 minutes to play. Invented by Doug Malewicki in 1965, this game has remained popular for over 40 years. Anyone who ever had to participate in a "civil defense drill" by hiding under his or her desk in grade school, or ever had a bomb shelter in the back yard should play this game. One of the few games where it is possible to have no winners (often everybody loses!). You have to play it to believe it. This game's a blast! It was chosen for Games Magazine's "Games 100" for 1984. "The quintessential `beer-and-pretzels' game: simple, fast, easy to learn, and loads of fun. Minimal prep time: shuffle the decks and deal." - Tim Kask, Adventure Gaming Magazine.